Up to Episode 13, I merely liked Brilliant Legacy a lot, but I wasn’t addicted to it. My feelings have now changed after watching Episode 14. On the surface Brilliant Legacy is a pot filled with ordinary ingredients. Imagine that weekly or fortnightly trip to the supermarket. You cruise the aisles and drop whatever catches your fancy into the cart. Perishables, toiletries, a squeaky toy for the dog, that latest edition of Time magazine, rice. Nothing in the cart suggests you’re planning a special feast for six. 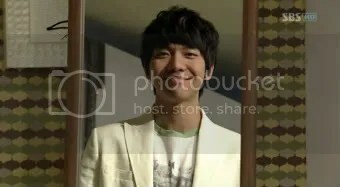 Brilliant Legacy is the same; it doesn’t break new ground with its plot devices, themes or characterization. Yet somehow, magically, it takes these common drama elements and weaves them into an intoxicating whole. Episode 14 is where it hit me and I had to laugh at the irony of it all: that I was now officially in love with the drama and the one responsible for my change of heart was none other than the guy I had affectionately (not!) called a royal jerk in Episode 1. Hwannie, what have you done? As is usual in this drama, Episode 14 picks up from where the previous episode left off, from where Hwan and Eun-sung are on the rooftop of the restaurant. He has come to make his intentions clear: He will prove himself to Grandma. He will not allow his inheritance to go to Eun-sung. As I’ve said previously, Episode 13 marks the turning point for Hwan. He has heard his grandma’s scathing condemnation of him and he has seen that she isn’t kidding about giving all her assets to Eun-sung. Something kicks in within him, like a light that keeps flickering and then all of a sudden it works, emitting a brighter and steadier glow than before. The Hwan that we will see in Episode 14 is startlingly different from the Hwan just two episodes ago. It isn’t just that he has decided that he will fight (in a non-physical sense) Eun-sung for the inheritance. It’s also how contemplative he has become, a change that became more apparent in Episode 13. He doesn’t react as impulsively; he mulls over what he hears and sees. And, in a subtle and most natural way, he is observing Eun-sung and seeing her differently, not as an irritant but as that new constant in his life. He is spending more time with her than with anyone else. (Two people can’t be together so much and remain unaffected by the other.) See how he walks behind her, how he watches her (from the upstairs balcony, for example), how acutely aware he is of her. (I love how slowly their relationship is developing. The pace feels exactly right; it makes every little progression all that much sweeter and credible. But even if he is still unschooled in matters of the heart, our leading man has decided to turn his life around with immediate effect. 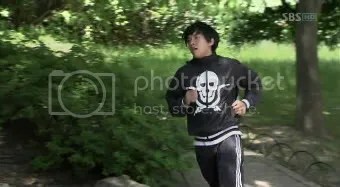 The next day, before leaving for work, he wakes up early for a run around the neighborhood. It’s a scene that underscores how seriously he considers Jun-se a rival. Jun-se made all the girls squeal in Episode 13? Ha! Think I can’t work up some sweat, too? Just watch me! Running only long enough to work up a few barely noticeable drops of sweat (you can spot them if you peer hard enough with a magnifying glass), Hwan pauses for breath and scans the surroundings. Hmm, what’s with the furtiveness? Checking to see if Eun-sung is around? But the poor thing does not know the world’s fastest woman is in the vicinity. One second ago she isn’t there and now she’s right in front of him, smiling in amusement at this man bowing to her. To his credit, Hwan does not let a little embarrassment deter him from his goal: the Most Friendly Employee of the Month award. So he goes back and continues to hone this new and oh-so-difficult skill, standing before the mirror in his room and forcing his mouth to stretch sideways. His muscles, unused to the strain, protest feebly. The result of all that effort? A grimace smile. A smile soon to be patented. All that practice pays off. Look at how spontaneously our reformed employee smiles at the customers, how quickly he jumps to serve them. It’s as if he’s born doing this, as if being a waiter is his life’s calling. The wondrous sight is enough to make you weep. If you have ever despaired about anything, take heart from this miracle. Nothing is impossible! Of course Hwan’s astonishing behavior does not escape the sharp eyes of his colleagues. And of course he’s embarrassed that they’re staring at him dumbfounded. His smile switches off instantly and he runs off to the rooftop for refuge. Poor Hwan. It truly is excruciating to be this friendly, isn’t it? More so when you have to do it in front of the manager and Eun-sung, both of whom have seen you at your most scowly. You, the rightful heir to the company, now having to behave in this servile manner. And still the ordeal continues, as if part of a master plan to break him, to test his every resolve. Help out with valet parking, the manager orders Hwan during their lunch break. Sure, Hwan replies matter-of-factly, causing Eun-sung’s eyes to once again threaten to pop out of their sockets. Did the sun rise from the west today? Even when he’s almost violated during valet duty (two women customers press a tip into his palm and one of them even pats his bum! ), Hwan grits his teeth, swallows his pride, and makes Eun-sung gasp. All her training finally paying off! Let’s leave Hwan and Eun-sung aside for now and catch up with that delicious subplot twist that I was telling you about in the previous episode. Hwan’s mom and sister have left home and are now making themselves comfortable in the witch’s house. As expected, the witch puts on an impressive show, welcoming her guests warmly, cooking up a storm for them, and tidying a spare room for Hwan. It’s already midway in the drama (14 out of 28 episodes) and it’s high time we begin to see the witch and the witchling suffer. Our wishes are answered that night when everyone retires to bed, opting to co-sleep according to age instead of the wiser (on hindsight) option of familiarity. Thus Jung sleeps with Seung-mi while their moms sleep together. Showing that she’s learning fast from her mom in the art of insinuation and instigation, Seung-mi hints to Jung that she should quickly get herself wedded to Jun-se. What if he falls for another girl? Jung wails in response, even as she dismisses the whole notion. Of course Jun-se would not date anyone but herself! A different drama, sans conversation, is unfolding in the next room. The witch can’t sleep because Jung’s mom is snoring like a porker. Now we know the real reason why Baek Sung-hee doesn’t want her husband back. It’s not because he deceived her by playing dead, it’s because he snores and she’s a light sleeper! The secrets you unearth in the middle of the night. Hwan’s mom complains that she didn’t sleep a wink last night, causing the one who really didn’t sleep a wink to roll her eyes. When the witch and her daughter leave for work (Jung leaves as well, no doubt to check on her Jun-se), Hwan’s mom pokes listlessly around the house, opening wardrobes and drawers as though they are her own. Hmm, strange that there aren’t clothes or photos of Sung-hee’s husband. Is he really in Vietnam, like Sung-hee says, or did they divorce? Those questions immediately tire her out. (Any attempt to think will always do that to her. Also, she didn’t sleep at all last night, remember? Oh, the suffering!) Thus, the witch returns later to the sight of her friend of long ago, soon to be enemy if this keeps up, lying on the couch and everything in a mess. But the scare tactics work and Hwan is summoned to bring them home. He shows up at the house (and it’s amusing to see how polite he is around Seung-mi’s mom) and is given a tour of Seung-mi’s bedroom. The occasion allows us a rare glimpse into Hwan a few years ago. While packing (how funny that the mom-and-daughter duo should actually unpack, as if planning for a long stay), Jung chances on one of Seung-mi’s bags and demands that the latter give it to her. Seung-mi is reluctant, because the bag is a gift from Hwan. Unknown to Seung-mi, her mom had earlier hidden their family photo (all five of them together, taken when Seung-mi and Eun-sung were still in school) in that bag. But Jung gets her way and trots off happily with it. The witch, overwhelmed that she has gotten rid of her pests, offers to drive everyone home. No one has any idea of the storm that awaits them. In Episode 13 we saw Grandma in tears, berating her family for taking her for granted and kicking up so much fuss over the inheritance. Now we see her at her angriest. Outraged that her daughter-in-law and granddaughter should have the audacity to return home, Grandma chases them out of the living room. She even follows them to the porch, yelling and crying. The two returnees, no longer jolly, cower in fear. This is not the contrite grandma they are expecting, thrilled to see her lost sheep home. This is a grandma so angry the butler fears she is tottering on the edge of a dangerous collapse. Talk about a backfired scheme. It’s a lesson the clowns won’t easily forget. We learn a few more facts about our grandma from this episode. 1) She’s scary when she’s mad. (Ban Hyo-jung is an awesome actress and this is easily her best scene so far. No wonder everyone stares at her, because the script calls for it and also because she is simply mesmerizing.) 2) Blood ties are immensely important to her. The conduct of the ingrates hurt so intensely because after telling them how much she loves them and after having provided for them for so long, they still dare to walk out, insisting they are cutting off their ties with her unless she revokes her new will. 3) Contrary to her expressed disappointment with Hwan, she really is soft-hearted with him. As a result of his plea, the outcasts are given a reprieve. But this is the last chance, Grandma warns. Pull the same stunt again and you’re out of here forever. In the midst of the storm, allow me to divert your attention to a fleeting moment that made me laugh. (You must watch to the end of the episode to appreciate the mirth in the image below.) See the two guys looking at each other, the older one with more tenderness than usual? A certain kitchen scene later may reveal the reason. You see, after being so soundly chastised, Hwan’s mom knows better than to ruffle her mother-in-law’s feathers again. The next morning she is merely ten minutes late waking up for breakfast duties. Butler Pyo, fashionably decked out in a bandana and wearing his trademark rabbit-ears tie, is waiting for her. They engage in banter, he chiding her for being late and she suggesting that he should be happy without her presence since that will mean he can date without her watching his every move. Me date? Whatever gave you that idea? Hmm, she replies, I saw you coming down from Eun-sung’s room a few times so I thought the two of you were… I don’t go for younger women, he snaps. But why not? our busybody asks. Because I like older women! Butler Pyo, thanks for spilling the beans. (His revelation is one more reason why this episode is so delightful. An unexpected comical twist to counter the scenes of tears and rage last night, a new development that reveals the layers of characterization even for a supporting role. Love it!) Your every act is going to be so closely watched by us from now on. Can’t wait to see if your feelings will be reciprocated! Let’s go back to Eun-sung. She has been taking quite a backseat in the plot lately, hasn’t she? See what you have done to Hwan’s family, the witch says. But the Eun-sung sitting next to her on the park bench has her own counter-accusations. I know why you abandoned Eun-woo. Because he has a photographic memory and you don’t want him to tell me your new address or phone number. If Hwan is so important to Seung-mi, don’t let me be a hindrance, just let them marry. But Hwan will never get his hands on Grandma’s inheritance, it is mine. I will make sure of it. We now move back to the second branch to see what Hwan and Eun-sung are up to next. Hearing that, the manager marches over and ticks Hwan off for his rudeness. The culprit and Eun-sung react with surprise to the manager’s scolding, so used are both of them to each other’s curtness and impolite speech. So off to the rooftop the two troop, to iron out yet another kink in Hwan’s ongoing training. Try calling me “Chief,” Eun-sung urges. But “chief” sounds similar to “master” and it’s the latter that comes out of Hwan’s mouth. What’s so funny? 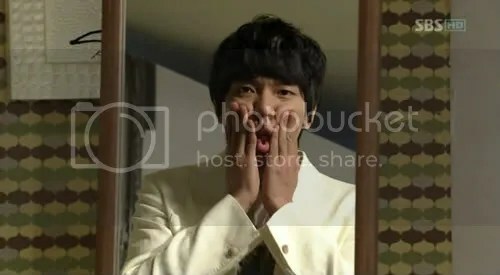 snaps Hwan when Eun-sung bursts out laughing. But even though he seems outwardly annoyed, a strange thing is happening to Hwan. Somehow the sight of Eun-sung throwing her head back, covering her mouth, bending over in uncontrolled laughter, holds him spellbound. He stares at her, lost in the moment and forgetting he’s supposed to be angry. Unknown to him, it’s yet another addition to his growing collection of “Favorite Eun-sung Moments” that he’s storing in his heart. Let’s leave Hwan to his musing because a most urgent task awaits. Nearly three thousand words and I have yet to unveil a pic of Mr. Soulful Eyes? I ought to be spanked! The scene before us is of Jun-se and his dad, sitting in that glorious garden cafe that belongs to the younger Park. Park Senior is still mad about Grandma’s new will and he wants Jun-se to help him secure his hold on the company. How? By joining Jinsung Food. But I enjoy what I’m doing here in my cafe, Jun-se replies. It’s what Granddad wanted me to do when he left the business to me. Jun-se’s refusal to follow his father’s wishes leaves the latter fuming. Seung-mi is impersonating Eun-sung (who’s supposedly in America with Eun-woo) and writing e-mail messages to the dad, implying that his reappearance is upsetting to her. The father replies, imploring her forgiveness. His tone is so sad, even our witchling can’t help but feel a slight twinge of remorse. Seung-mi will soon have troubles of her own. Remember the bag that Jung poached from her? Well, Hwan has gotten it back and now he’s about to meet Seung-mi to return the bag. The two will have dinner and watch a movie together. Hwan, Hwan, you never fail to make me laugh in this episode. But like I wrote earlier, there’s trouble ahead for Seung-mi. 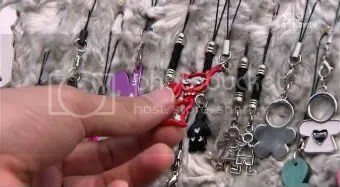 Hwan opens her bag to put his little gift and finds a photo inside. Curious, he takes it out. Staring up at him from that old photo are three familiar faces: Seung-mi, her mom, and… Eun-sung. How will Hwan react and how will Seung-mi extricate herself this time? Stay tuned to the next episode! 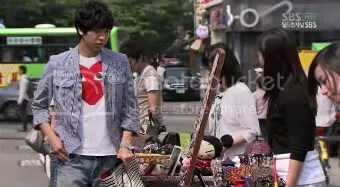 here Brilliant Legacy: Episode 14 | thundie’s prattle. Is it just me or does it give the impression like some of these responses come across like coming from brain dead individuals?